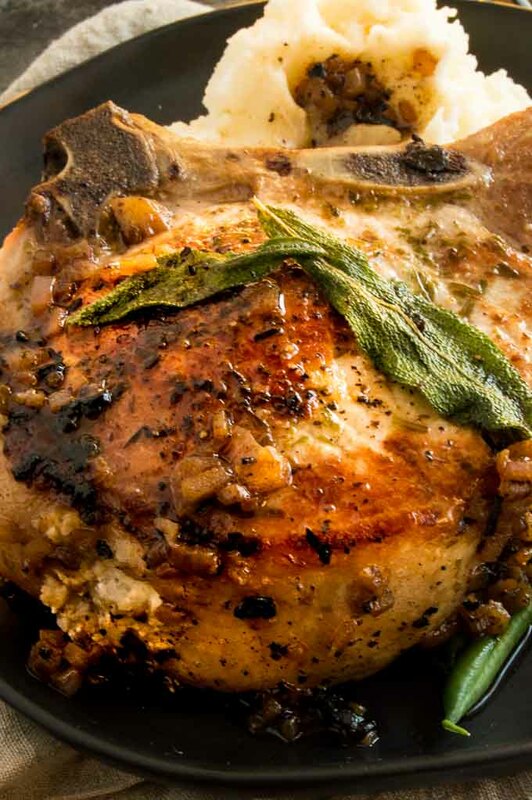 Savory Baked Stuffed Pork chops are filled with hints of apples, mushrooms and creamy cheese. Easy Gourmet meal to make for weeknight entertaining. Perfect alternative to Thanksgiving turkey. I love stuffing and it’s criminal that it’s usually only served around Thanksgiving. 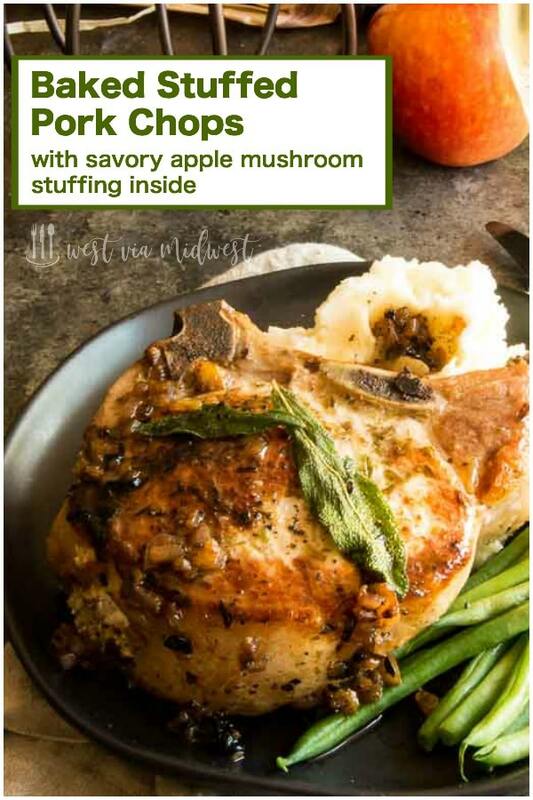 I decided I’d make a savory apple stuffing to go inside a juicy succulent baked pork chop. 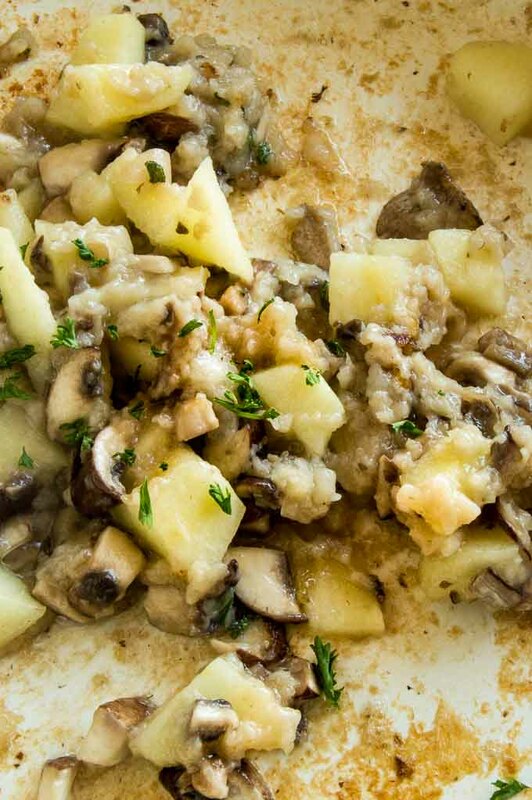 The stuffing has all of the flavors of fall with apples, mushroom, mixed with parsley and sage. To tie it all together there is a tangy goat cheese way in the back of the stuffing pocket that as it cooks spreads out into the stuffing! Pork Chops are a simple dish but there tends to be a lot of questions regarding them. I’m going to answer all of those questions and share with you an easy recipe for enjoying for dinner with friends or as a gourmet meal alternative to serving turkey on Thanksgiving! 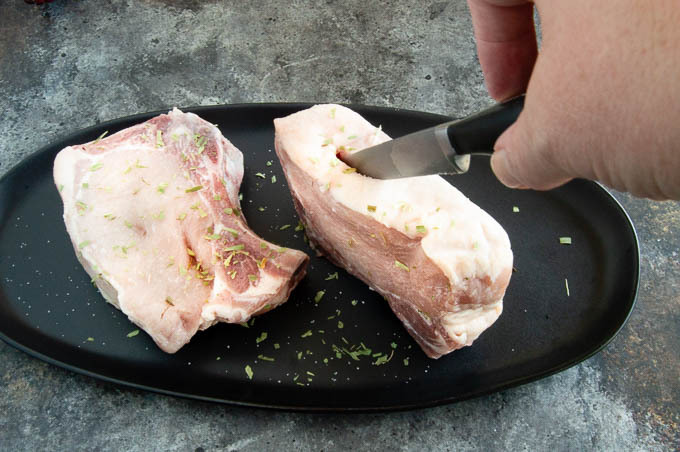 What temperature should you cook pork chops to? How do you make the pocket for stuffing to go into? Can you use a boneless pork chop for stuffing? This simple stuffing for these pork chops has just a few ingredients, but they pair beautifully with the pork. No heavy chopping involved here. How do you make a stuffed pork chop? Start with getting a thick bone in pork loin chop. I suggest 1 1/2 inches in thickness. Cut a slit that is 2″ long along the side, then take your knife and create a pocket that runs almost all the way to the edge of the chop to the bone at the center. Make a quick bread stuffing to slide inside. Saute the stuffing quickly then allow it to cool before stuffing it inside. Place the bread/apple/mushroom stuffing inside. Allow the pork to rest to absorb the juices. What temperature is safe to eat for pork? What kind of pork chop should I use? Can I use something besides and oven to bake the pork chops? yes! You can do them on the grill in indirect heat. You will need to use a thermometer to check the temp of your grill. Instead of browning them on the stovetop you can sear them on the grill then move them to indirect heat for finishing the cooking. Tips for making the baked pork more gourmet looking! Before you turn off the skillet after browning the pork chops. Add some whole sage leaves to the oil and fry them for 15 seconds on each side. Save them to place on top right before you serve them. Can you make this ahead? You can prepare everything up until the actual cooking of the pork chop. Prepare the stuffing and keep it in a separate container in the fridge. Season the chops and have the pocket all ready to go. 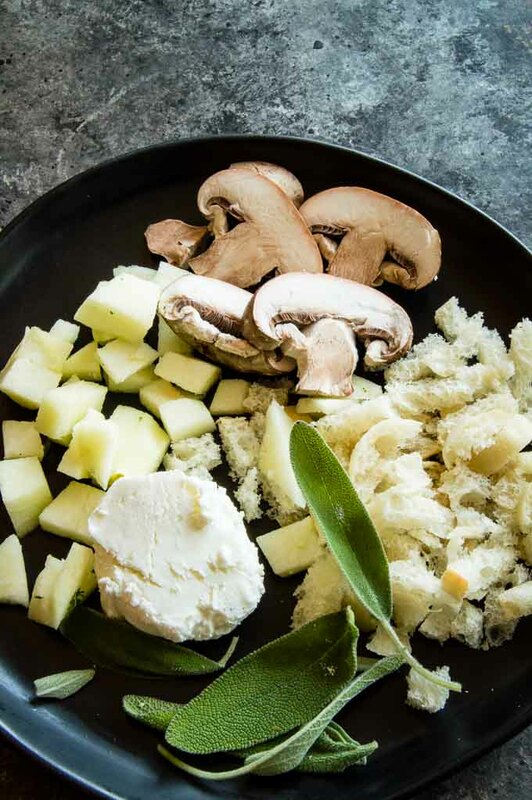 Take the ingredients out of the fridge about an hour before you are ready to make them. (If you don’t the pork cooking times will be off becasue the pork will be colder so it will take longer. Pork chops and stuffing is ideal as a substitute for turkey as a main course for Thanksgiving. It will pair with all of the sides that you expect at the holiday but you wont have to spend hours roasting a whole turkey. Heat a cast iron pan to medium high. Melt one tablespoon butter in it. Once melted add apples, bread, sage, parsley and onion and sautée for 5 minutes until apples are softened and onions are translucent. Remove from pan and place in a bowl to cool. Salt and pepper all sides of pork chops. Cut a 2 inch slit in side of pork chop to create a pocket. The slit will only be 2 inches at the incision but inside the pork chop you will create a large pocket to have the stuffing and goat cheese fit into. Remove skillet from stovetop, turn off burner but dont wash the pan. You will reuse the pan once you stuff the chops. Divide goat cheese (or cream cheese) between all pork chops. Stuff the cheese all the way to the back of the pocket. Then divide stuffing mixture between all pork chops and stuff that in as well. Add 1 tablespoon of oil to the same cast iron pan. Turn temp back on to high. Once sizzling sear all sides of pork chops until each side is golden brown. About 4 mins per side. You may need to do this in batches. Place pork chops into an oven safe baking dish, and cover with foil. Bake for 30 minutes then remove the foil. Continue to bake until pork has reached an internal temperature of 145°. Allow the pork to rest for 10 mins after removing from the oven so allow the juices to reabsorb. 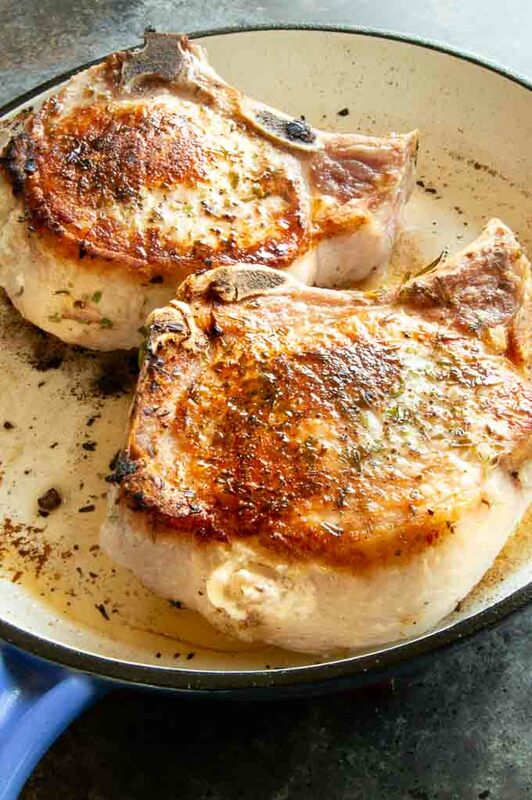 These pork chops look simply amazing. When I think of pork chops, I always think of my mom. She would have loved this recipe! The chops look so delicious and moist which is a requisite for me! I am putting thick cut pork chops on the grocery list. These look gorgeous! This sounds like a meal I could love. 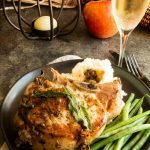 Pork Chops with apples is one of our favorite fall dinners and this recipe did not disappoint! So much flavor! These pork chops just scream Fall! This is a great recipe!